Rainbow Day Camp is the recipient of our Meeting Eighteen Donation! Three Great Presentations and One Successful Charity! Here’s your recap for last night’s meeting. You can follow this link to make your payment online! What a great way to start 2019! It may have beencold outside, but we had warm hearts and plenty of enthusiasm as we focussed on great new initiatives for the New Year. With 150 committed donations, we held our eighteenth meeting of 100 Women Who Care Guelph at Cutten Fields. Our networking session, sponsored by our valued 100WWCG members Sandra Lastovic of The Mortgage Centre and Irene Szabo of Home Group Realty, began at 6:00 pm. It was great to hear from Sharon ‘s introductory remarks, that once donations for this evening’s successful charity have been collected, 100WWCG will have raised more than $220,000 for local charities! Interested members should contact Sharon Lewis (519) 780-0468 or Tannis Sprott (519) 763-1172 as soon as possible. After Sharon’s short presentation, Gail Hoekstra, Executive Director of The Drop In Centre, drew the names of this quarter’s nominees from a hat, and our charity presentations began in earnest. 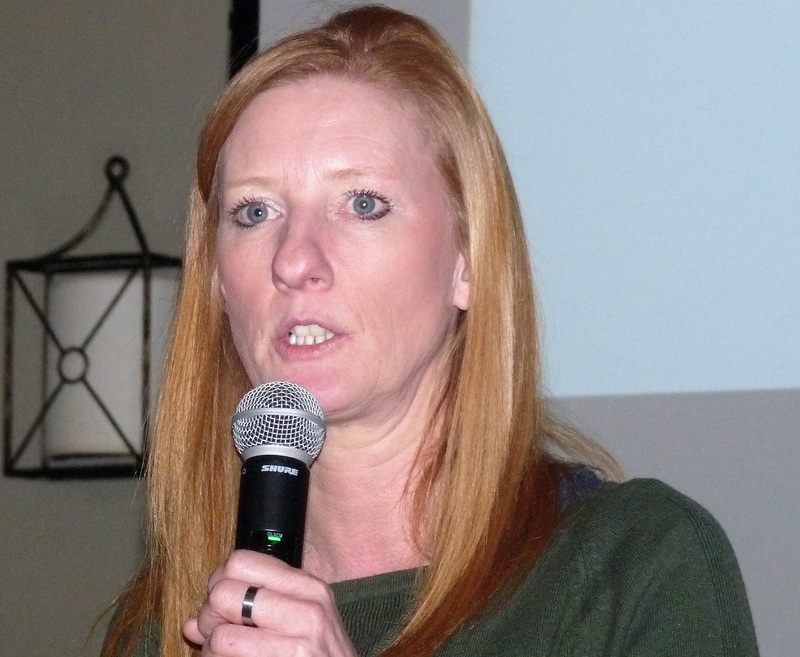 Jennifer Harrison presented on behalf of Rainbow Day Camp. This program offers Guelph and the surrounding area a summer recreational day camp experience for children and youth, providing quality programs in a caring, open and inclusive environment which embraces diversity and encourages personal growth, according to each individual’s strengths, needs and abilities.. Using a “real life” story, Jennifer stressed the important impact that the Rainbow Day Camp experience has on the empathy that kids and their families have for others. Wendy Clayson presented on behalf of Michael House, .a pregnancy and parenting support service which provides programming and residential support to women coping with crisis pregnancy. Wendy read an inspiring note from a previous client who attested to the positive impact she had experienced at Michael House and how it had changed her life. Greta Najcler presented on behalf of Community of Hearts. This not-for-profit supports adults with developmental exceptionalities, to achieve success in curriculum-based quality programming, build self confidence and become more engaged in our community as they grow and learn. Program content teaches the three pillars of Self-Awareness, Self-Management & Self-Advocacy/Expression to ensure participants achieve the level of independence they desire. There was an opportunity after each presentation for members to ask a few questions and clarify any .issues that might not have been addressed by presenters. Members enthusiastically asked for more information about the programs offered and funding models employed by each of the nominees. Once all presentations had been made and all questions were answered, members voted for this quarter’s successful charity. While members’ votes were being tallied, a representative from last quarter’s successful charity took the opportunity to say a wholehearted “Thank you!” to the group . 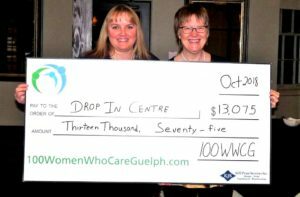 Using examples of real life situations, Gail Hoekstra spoke passionately about the impact of our October donation on The Drop In Centre. Monies donated to the centre have been dedicated to an emergency medical fund which addresses specific client needs for people without means to pay, including prescription medication, emergency medical care not covered by OHIP, or critical dental work . Members were pleased to hear about the substantial impact their donations have made to this valuable Guelph community space. To read the full transcript of her comments, follow this link. Our first chosen charity of 2019 is Rainbow Day Camp. Our donation is slated to be used to assist with providing staff who will work one on one with special needs children within the Inclusion Program. By following this link, you can read our press release which provides even more information about this quarter’s chosen charity. This entry was posted in Notes on Meetings on January 16, 2019 by Miriam Vince.